The gentleman who gave me the report from South Aberdeenshire that I forwarded last week, has sent me the attached - his notes and two photos which may be of interest. His sister-in-law referred to is a vet. Hi Phil I have attached some photos taken at the weekend. We managed to get up enough courage to go poking round the plantation woods. They contain many carcasses of sheep, lambs, rabbit and deer, and that is just in the fire break through the middle of the plantation. I thought the ones I have sent the most interesting. This deer carcass was in thick plantation in a drainage channel and had been carried there. This was evident from the fur on the trees . It had been scraped against describing the path it had taken. From the look and smell I would say it was not older than 2 months, probably 1 month. In the close-up of the head you can see that a large chunk has been taken out of the back of the lower jaw on both sides. Also the the ends of the ribs where removed like a pair of shears had been taken to them. I forgot to include any indication of scale in the photos. It was a large full grown roe deer. There were no other parts of the carcass near by. At present I am building a chronological document of the events with maps and pictures of everything we have relating to this possible big cat. I will send you a copy when I have finished. One question that keeps coming up and my sister in law thought didn't make sense, is why an animal of that size would take a chicken, eat half of it and then cover it up 20 feet from where it got it.Any theories. I also have meaningless photos of possible tracks. The interesting thing about these is that the marks are almost in a straight line. I believe this is more cat like than dog. Distance between each fourth mark is just under 4 foot.They were found leading out of the same wood in that night's dusting of snow. If you would like to see them let me know. If indeed the animal had been carried there (evidenced by fur scraped on trees reported) this is quite possibly a cat kill. Carrying the animal into cover to eat is not typical of a leopard in normal conditions - don't know about puma though. A leopard will usually eat in open unless it feels under threat - the tree caching is to protect the food from scavengers. I have seen a leopard eat an antelope within yards of cover it could have taken. does anyone know about puma eating habits? The shearing of ribs is not distinct on photos but I feel may be indicative of a cat, as I believe any native British predator or scavenger would gnaw rather than shear the bone. The tissue damage to rear of jaw could however be from a scavenger. At first glance I see no sign of skin other than on hooves/lower leg. The head does look as though skin has been almost licked off, less clear on rest of carcass. What does anyone else think? I do think a cat may well be involved here. One detail which will usually distinguish a cat kill from other animals, is hair from the prey spread around the area. Cougars and lynx will lick or rip away deer hair to avoid swallowing it. They will commonly use their teeth to scrape this hair from their tongues, but I suppose if a tree or some object being available, they might use that. I would guess that a leopard more likely would do the same, but I have never known a dog to practice this habit. Thanks for the comment - the photo does show a degree of hair spread about, as well as the reported scraping on trees. I think the guy who sent me the photos felt the deer had been dragged through dense foliage to a place "safe" to eat (that's what made me suspect not leopard as I've known leopard eat within plain view of a village rather than carry a kill). There does not seem to be any hair attached to the deer carcass. Still not sure - it could also be a deer poached out of season and hidden to avoid detection, with only choice bits removed by poacher, and remains scavenged. I guess it needs a p-m to be certain. How does one train to be an amateur pathologist? "We managed to get up enough courage to go poking round the plantation woods . They contain many carcasses of sheep , lambs , rabbit and deer"
Am I the only one who thinks this is highly unusual? 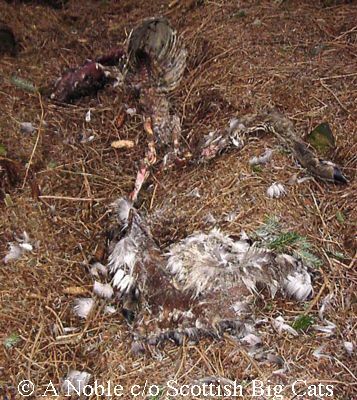 I have spent many many hours in woods and have not encountered what has been described here - a stash of animal carcasses. This is really exciting. I haven't seen images yet so can't give an opinion. Puma and Lynx will both drag prey into cover. Both also kill by severing the spinal cord behind the head. I seem to remember that either Nigel Brierley or Trevor Beer mention in their monographs of finding a "deer graveyard". I think it was Trevor Beer. He stopped taking his dog as the animal was very wary of the area and he saw a large black cat in the vicinity at one visit. This cache of animal remains is characteristic of puma. They frequently do this, and I have seen several such, in bracken or undergrowth. Sometimes a favourite cache is used for months, to judge from the state of the bones. I have also occasionally seen ribs sheared off. 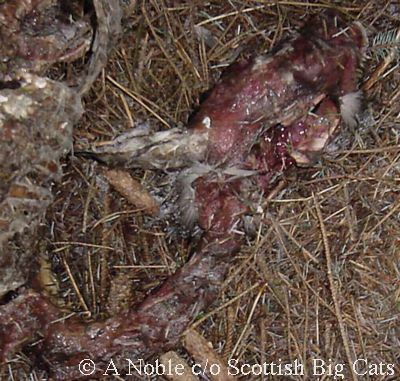 Bones licked clean, stomach contents left or moved a short distance away, are also commonly seen at cat kills.